Morocco offers great diversity of landscapes and geographic features. Probably the most well known images of Morocco are definitely the Sahara Desert dunes in the region of the village of Merzouga in southeast Morocco. The dunes of Erg Chebbi are one of the most beautiful places in Morocco and you just must go there – Don’t miss it! 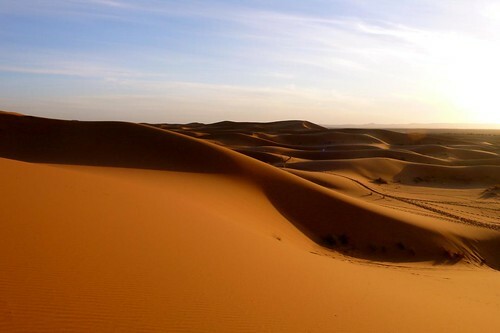 If you ever dream about an amazing sun set in the Sahara, your best chance is in Erg Chebbi Dunes – Sahara Desert. 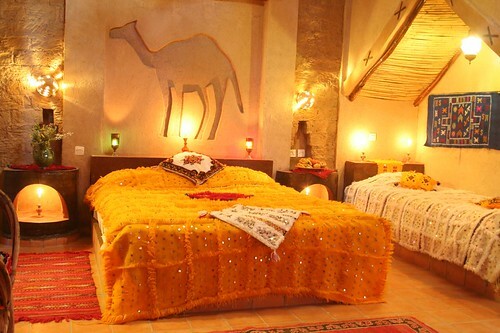 We advise you to stay in Auberge du Sud, an gorgeous Sahara hotel located in the bottom of Merzouga Dunes. Auberge du Sud offers camel trekking, desert excursions 4X4, bivouac nomad camps inside the dunes, swimming pool, restaurant and amazingly decorated fully-equipped rooms. Merzouga Hotel Auberge du Sud offers great quality accommodation and perfect accommodation services, night parties with unique drum music from the region, amazing trip and camel treks and probably the best food you’ll ever taste in Morocco.